Closely related to radiographic contrast is the concept of exposure latitude. Exposure latitude is the range of exposures over which the recording medium (image receptor) will respond with a diagnostically useful density; in other words, this is the “flexibility” or “leeway” that a radiographer has when setting his/her exposure factors. Images having a short-scale of contrast will have narrow exposure latitude. Images having long-scale contrast will have a wide exposure latitude; that is, the radiographer will be able to utilize a broader range of technical factors to produce a diagnostic-quality image. Geometric magnification results from the detector being farther away from the X-ray source than the object. In this regard, the source-detector distance or SDD (also called the source to image-receptor distance or SID) is a measurement of the distance between the generator and the detector. The estimated radiographic magnification factor (ERMF) is the ratio of the source-detector distance (SDD) over the source-object distance (SOD). Organs will have different relative distances to the detector depending on which direction the X-rays come from. For example, chest radiographs are preferably taken with X-rays coming from behind (called a “posteroanterior” or “PA” radiograph). However, in case the patient cannot stand, the radiograph often needs to be taken with the patient lying in a supine position (called a “bedside” radiograph) with the X-rays coming from above (“anteroposterior” or “AP”), and geometric magnification will then cause for example the heart to appear larger than it actually is because it is further away from the detector. Soft tissues are seen with the same machine as for hard tissues, but a “softer” or less-penetrating X-ray beam is used. Tissues commonly imaged include the lungs and heart shadow in a chest X-ray, the air pattern of the bowel in abdominal X-rays, the soft tissues of the neck, the orbits by a skull X-ray before an MRI to check for radiopaque foreign bodies (especially metal), and of course the soft tissue shadows in X-rays of bony injuries are looked at by the radiologist for signs of hidden trauma (for example, the famous “fat pad” sign on a fractured elbow). NOTE: The simplified word ‘view’ is often used to describe a radiographic projection. Oblique – Projection taken with the central ray at an angle to any of the body planes. Described by the angle of obliquity and the portion of the body the X-ray beam exits; right or left and posterior or anterior. For example, a 45 degree Right Anterior Oblique of the Cervical Spine. Stress Views – Typically taken of joints with external force applied in a direction that is different from main movement of the joint. Test of stability. HBL, HRL, HCR or CTL – Horizontal Beam Lateral, Horizontal Ray Lateral, Horizontal Central Ray, or Cross Table Lateral. Used to obtain a lateral projection usually when patients are unable to move. Decubitus – Patient lying down. Further described by the downside body surface: dorsal (backside down), ventral (frontside down), or lateral (left or right side down). Projectional radiography of the breasts is called mammography. This has been used mostly on women to screen for breast cancer, but is also used to view male breasts, and used in conjunction with a radiologist or a surgeon to localise suspicious tissues before a biopsy or a lumpectomy. Breast implants designed to enlarge the breasts reduce the viewing ability of mammography, and require more time for imaging as more views need to be taken. This is because the material used in the implant is very dense compared to breast tissue, and looks white (clear) on the film. The radiation used for mammography tends to be softer (has a lower photonenergy) than that used for the harder tissues. Often a tube with a molybdenum anode is used with about 30 000 volts (30 kV), giving a range of X-ray energies of about 15-30 keV. Many of these photons are “characteristic radiation” of a specific energy determined by the atomic structure of the target material (Mo-K radiation). Conditions commonly identified by chest radiography include pneumonia, pneumothorax, interstitial lung disease, heart failure, bone fracture and hiatal hernia. Typically an erect postero-anterior (PA) projection is the preferred projection. 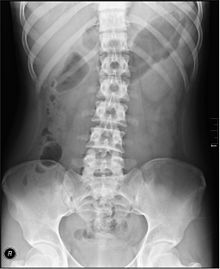 In children, abdominal radiography is indicated in the acute setting in suspected bowel obstruction, gastrointestinal perforation, foreign body in the alimentary tract, suspected abdominal mass and intussusception (latter as part of the differential diagnosis). Yet, CT scan is the best alternative for diagnosing intra-abdominal injury in children. For acute abdominal painin adults, an abdominal x-ray has a low sensitivity and accuracy in general. Computed tomography provides an overall better surgical strategy planning, and possibly less unnecessary laparotomies. Abdominal x-ray is therefore not recommended for adults presenting in the emergency department with acute abdominal pain. The standard abdominal X-ray protocol is usually a single anteroposterior projection in supine position. A Kidneys, Ureters, and Bladder projection (KUB) is an an anteroposterior abdominal projection that covers the levels of the urinary system, but does not necessarily include the diaphragm. Dental radiography uses a small radiation dose with high penetration to view teeth, which are relatively dense. A dentistmay examine a painful tooth and gum using X-ray equipment. The machines used are typically single-phase pulsating DC, the oldest and simplest sort. Dental technicians or the dentist may run these machines; radiographers are not required by law to be present. An derivative technique from projectional radiography used in dental radiography is orthopantomography. This is a panoramic imaging technique of the upper and lower jaw using focal plane tomography, where the X-ray generator and X-ray detector are simultaneously moved so as to keep a consistent exposure of only the plane of interest during image acquisition. Sinus – The standard protocol in the UK is OM with open mouth. Facial Bones – The standard protocol in the UK is OM and OM 30°. Cervical Spine: The standard projections in the UK AP and Lateral. Peg projection with trauma only. Obliques and Flexion and Extension on special request. In the US, five or six projections are common; a Lateral, two 45 degree obliques, an AP axial (Cephalad), an AP “Open Mouth” for C1-C2, and Cervicothoracic Lateral (Swimmer’s) to better visualize C7-T1 if necessary. Special projections include a Lateral with Flexion and Extension of the cervical spine, an Axial for C1-C2 (Fuchs or Judd method), and an AP Axial (Caudad) for articular pillars. Thoracic Spine – AP and Lateral in the UK. In the US, an AP and Lateral are basic projections. Obliques 20 degrees from lateral may be ordered to better visualize the zygapophysial joint. Lumbar Spine – AP and Lateral +/- L5/S1 view in the UK, with obliques and Flexion and Extension requests being rare. In the US, basic projections include an AP, two Obliques, a Lateral, and a Lateral L5-S1 spot to better visualize the L5-S1 interspace. Special projections are AP Right and Left bending, and Laterals with Flexion and Extension. Pelvis – AP only in the UK, with SIJ projections (prone) on special request. Anterior area of interest – a PA chest X-ray, a PA projection of the ribs, and a 45 degree Anterior Oblique with the non-interest side closest to the image receptor. Posterior area of interest – a PA chest X-ray, an AP projection of the ribs, and a 45 degree Posterior Oblique with the side of interest closest to the image receptor. Sternoclavicular Joints – Are usually ordered as a single PA and a Right and Left 15 degree Right Anterior Obliques in the US. Foot / Toes – Dorsoplantar, Oblique and Lateral.